All domain name investors say their parking revenue has decreased over the past few years. Stop complaining and do something about it. The last two weeks of the year are the perfect time to think strategically about building a business that creates cash flow in 2014. 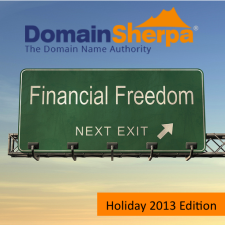 The DomainSherpa editorial staff has selected seven interviews — our must-watch recommendations for entrepreneurs and wantrapreneurs. The topics covered all relate to building a business, and include picking a business you’re passionate about, starting out with a sub-prime domain to prove your business model, looking at market trends, building a powerhouse business on an EMD, and the legal aspects to think about if you’re going to form a partnership. Watch the interviews below, load-up your phone with the MP3 downloads, set your podcast app to our iTunes stream, download the transcripts, or bookmark this page. Remember, there are four ways to learn with every interview. Nice…keeping this on my to-watch/listen list! Thanks for this…some valuable info in the lead generation interview! Thanks for all the exceptional information. A terrific series of interviews. As always very informative. The interview with Attorney Zak Muskovitz was excellent. Excellent: Really enjoyed listening & learning. Thank you; Health & Wisdom to you and Yours.